Earlier this week I announced a brand-new project: Verbal To Visual. The main motivation behind that project was the desire to have a place separate from this website where I can focus on teaching the skill of visual note taking. Along with that new space dedicated entirely to those learning to sketchnote, I’ve decided to change the name of the book that I’ve been working for many months now. Back when I was first developing the idea for what I initially called The Sektchnote Skill Builder, I was imaging a small booklet with a dozen or so activities to help you build your sketchnoting skills. In the intervening months the book evolved and grew in scope. So too did my desire to teach others the skill of visual note taking. That desire eventually resulted in the newly-launched Verbal To Visual. So as the scope of The Sketchnote Skill Builder expanded, and as Verbal To Visual came to life, I realized that the book was becoming much more an extension of Verbal To Visual than a small booklet of stand-alone activities. Because of that connection, I have decided to change the title of the book to The Verbal To Visual Notebook. I’m starting to think of it as the accompanying workbook to the blog posts and podcast episodes that are taking shape over at Verbal To Visual, and I hope the new title reflects that relationship. I’m really pleased with how The Verbal To Visual Notebook is coming together. I’ve been receiving good feedback from a few close friends that I’ve been showing the book to, but I’d like to reach out to a bigger audience before I publish the book in full. It can be a little too easy to get so focused on a project that it becomes impossible to see those spots where something is missing or something needs to be changed. So I’ve decided to do a beta test with an initial, text-only version of the book (the final version will be illustrated) in order to get feedback directly from the folks that I hope this book will benefit. Since the book is primarily a set of prompts to help you build your visual note taking skills in an intentional way, the text-only version is still packed with value. The final illustrated book will cost $20, but you can get it for $10 if you take a look at the beta version and give some feedback. Here’s how that will work: for $10 you’ll get the text-only version of The Verbal To Visual Notebook. Within about two weeks I’d love to hear your feedback – what you likee, what you didn’t, and any other comments or suggestions related to the book. I’ll then incorporate that feedback as I put together the final, illustrated book. Once that illustrated book is ready you’ll get it at no additional cost. Sound interesting to you? Want to help take this book from it’s verbal form and turn it into something visual? And get the final book for half-price? 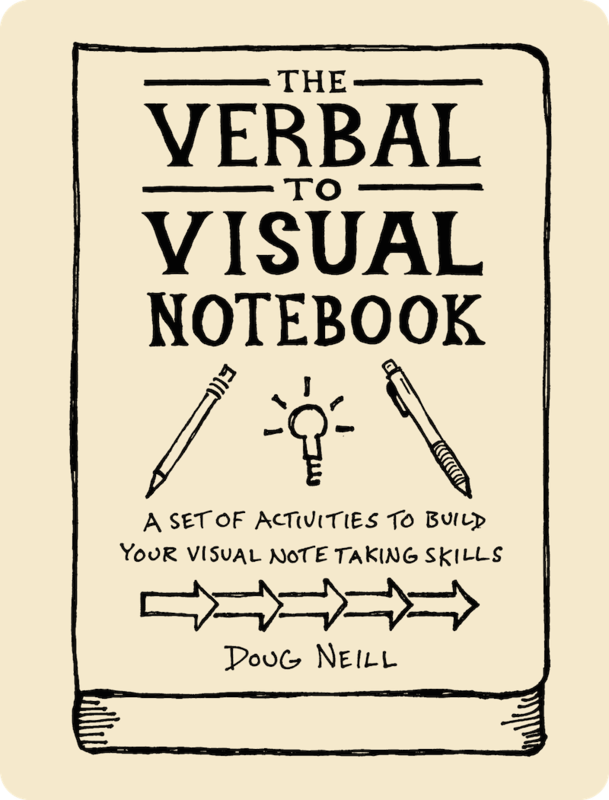 Here’s where you can get the text-only version of The Verbal To Visual Notebook. Thanks so much for considering – I know that with your help this book can help new and developing sketchnoters on their journey toward mastering this fun and useful skill.